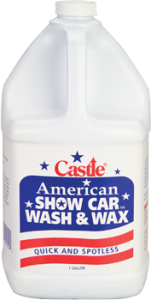 Castle® American Show Car Wash & Wax™ features a state-of-the-art formulation of high quality, high foaming soap, combined with acrylic polymers and sheeting agents. 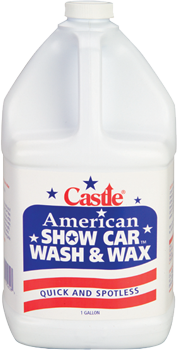 With American Show Car Wash & Wax™, you can wash and protect your vehicle with tough, resilient polymers in one easy step. 1. Pour 3 oz into a clean empty 5 gal bucket. 2. Fill bucket with a hard spray from hose. 4. Use a Castle® Wash Mitt to apply and clean vehicle. Rinse and dry with Castle® Chamois.